It received very favourable press reviews, and was later dubbed "The Poor Man's Aston Martin". Back in 1955, the public was eager for more creature comforts than were on offer with the MGA sports car of that period. This fact was expressed by the fact that factory hardtops were a popular addition to these cars. In 1956, a fixed head coupe version of the MGA still did not adequately cater for the needs of the market, since the cabin space was still insufficient. In fact, it would be another nine years, until the appearance of the MGB GT, before there was adequate provision for the comfort of the passengers, whilst still providing sufficient storage capability. Prior to 1965, the market's ideal was a sports car that had the styling of a true sports car, but also contained many of the creature comforts found only in saloon cars. 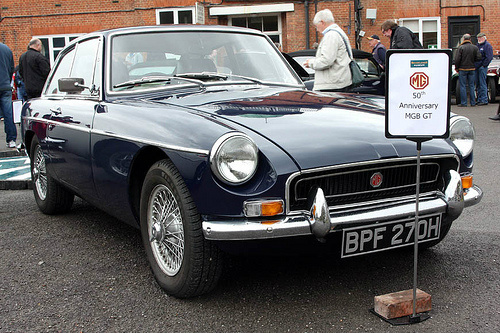 At its launch, the MGB GT was, compared with the MGA, a completely new sports car. There was considerably more room in the GT than there was in the convertible, even the version with the occasional rear seat. In respect of boot and carrying capacity, there was no comparison. However, the one disadvantage that the GT did have in relation to the convertible was that it weighed some 250 pounds more due to the presence of the hatchback. The result of this was that the GT's acceleration capability was somewhat lacking when compared to that of the convertible. However, owing to its more aerodynamic shape, its top speed was marginally higher. The Italian designers Pininfarina were given the contract for the body styling of the GT which was, in fact, the result of the latest design technique of computer aided design, which had recently been introduced. Mechanically, the convertible and GT versions were almost identical. Further, many components were to be found in both versions, apart from the doors, wings and roof which were specific to the GT. In 1964, and not before time, the inadequate three bearing crankshaft was replaced by a five bearing assembly. On the other hand, the GT was fitted with the five bearing unit from the very beginning. Furthermore, in terms of the Californian market, whose regulations were even stricter, a catalytic converter was required which had an adverse effect on output bhp. However, cars manufactured for the home market were not subject to all these measures. US safety regulations introduced the requirement that a five mph collision should not cause any damage to the vital parts of the vehicle. This meant that steel bars were fitted to both ends of the car to which were attached black polyurethane bumpers. Consequently, these bumpers would absorb a five mph collision and immediately revert back to their original shape. Such a requirement had a negative effect on the overall image of the GT, which was not helped by the fact that the car was now around seventy pounds heavier and five inches longer. In 1975, in order to celebrate the fact that MG had been manufacturing cars for fifty years, the company introduced the Anniversary MGB GT. This was a limited edition of 750 GT's based on the black bumper models that were introduced a few months earlier in order to satisfy US safety regulations. They were presented in green, with gold livery. 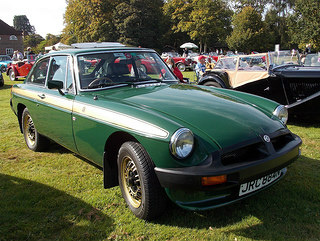 Once 1980 had been identified as the end of MGB production, another limited edition production run involved 1,000 of the cars showcased in metallic paintwork. The seats of the convertibles were covered in orange and brown striped cloth. In 1979, with a slide in the value of the US dollar and a strengthening Pound, exported cars became uncompetitive, resulting in a severe decline in export earnings. Matters were not made any easier by the launch, in 1975, of the Triumph TR7 that became yet another competitor of the MGB which was, by now, beginning to show signs of ageing. Coupled with lack of investment due, in part, to the fact that British Leyland management tended to favour the Triumph range at the expense of MG, the end of the MGB sports car was inevitable. However, the GT established itself as a very popular car reflected in the fact that over 125,000 units of this versatile hatchback were finally built. A 1965-80 MGB GT, depending on condition, would command anywhere between a range of £4,000/$6,000 to £17,000/$27,000.